£50 Non- refundable deposit required to secure booking. Full payment required 6 weeks before arrival date. 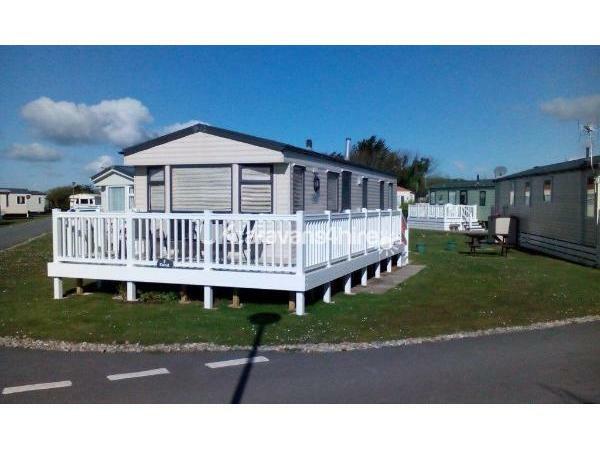 Willerby Savoy caravan .....Double glazed.... large enough to accommodate up to 6 people with full decking.... situated on a large south facing corner plot........consisting of three bedrooms , kitchen, lounge, dining area, large shower room with toilet and wash basin, large enclosed walk in shower cubicle, plus a separate cloak room with wash basin and toilet. 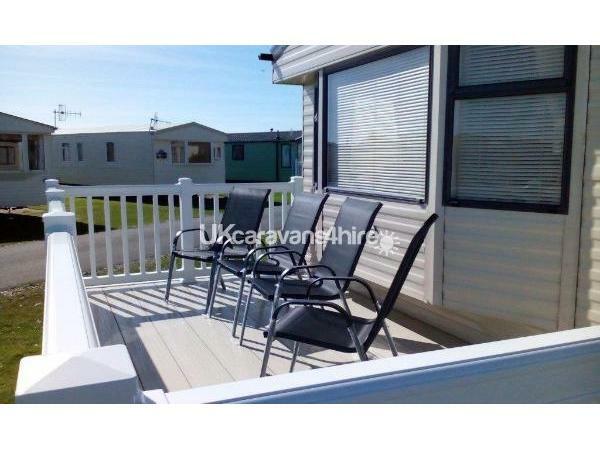 The caravan is situated in a quiet area away from the noise of the main complex yet still within an easy 5 min walk to the complex and a short flat walk on to the beach which also has vehicle access for the less able bodied. 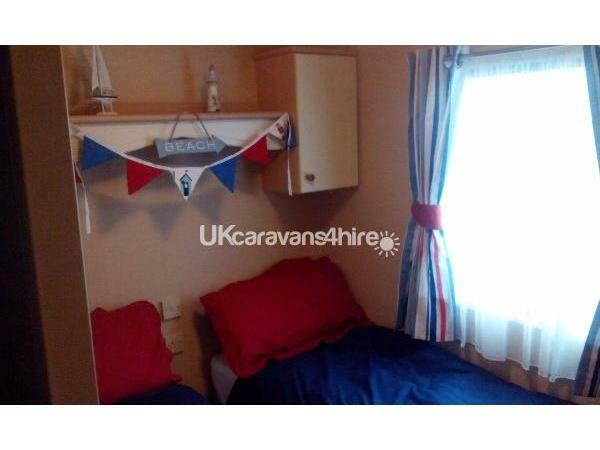 Full blow air electric heating in all three bedrooms keeping the caravan lovely, warm and cozy. We pride ourselves on high quality fixtures and fittings which you only get in a privately rented caravan ....... a real home from home with all those little extras's ....... a second tv/dvd player in the main bedroom, a hairdryer, iron and ironing board, clothes airer, dvd player in the lounge, large amount of adult and children's dvd's, games and books, loungers outside on the decking for you to relax in the sunshine, picnic bench for eating outside in the sunshine. Plastic picnic knives, forks spoons, plates, dishes and tumblers which you are welcome to take on the beach for your picnic. Large modern kitchen with full size oven, hob and extractor, fridge with large ice box, microwave, kettle, toaster and plenty of crockery and cutlery for 6 people. Large Dining area with ample seating for up to six people. The main bedroom has a double bed, triple wardrobes, dressing table with storage cupboard, mirror and over bed storage plus a TV/DVD player and hairdryer. 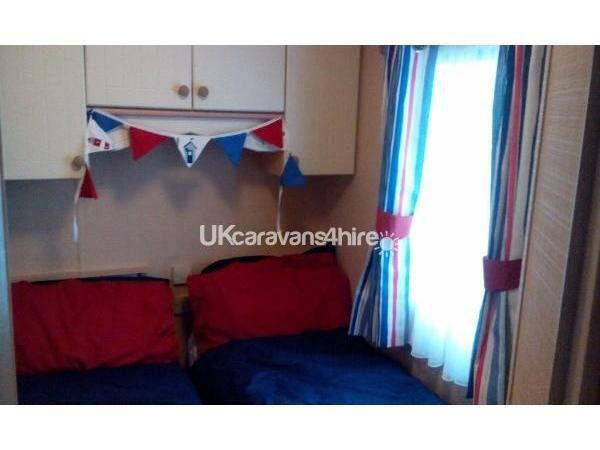 There are two further bedrooms with twin beds plus over bed storage and wardrobes. The large Shower room contains a wash basin with vanity unit for extra storage a mirrored bathroom cabinet with more storage, large enclosed walk in shower cubicle , toilet and a heated towel rail. 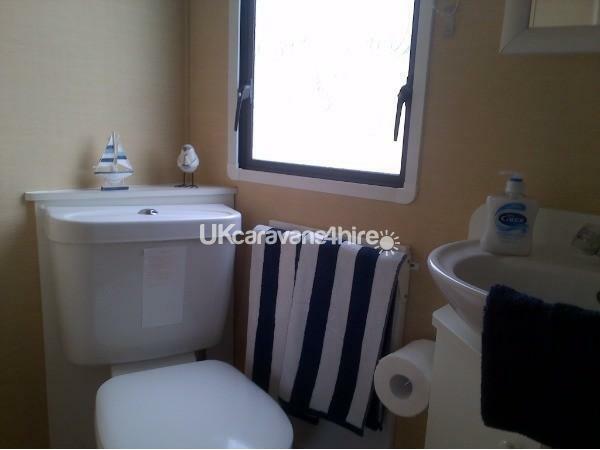 There is also a separate further cloakroom with mirrored bathroom cabinet with storage, toilethe and wash basin. Great for larger groups. The lounge has a modern electric fire with surround, a large flat screen TV with a DVD player, a large selection of games, dvds and books for both adults and children, venetian blinds, coffee table and plenty of comfy seating for up to 6 people. Bed linen and towels are not supplied you will need to bring your own sheets and towels. DOG FRIENDLY - we accept one medium/large dog or two small ones for which we charge £45 for the duration of your stay. Outside full south facing decking with comfy loungers to sit and relax in the lovely sunshine whilst watching the world go by. The decking has a lockable gate perfect for the safety of children playing outside. There is a patio area with a wooden bench for eating outside on those long hot sunny days. A short flat walk away gives you direct access on to the blue flag Black Rock sands beach, two miles of golden sand which also has vehicle access for the less mobile. Bath towels and tea towels are not provided. This is a NO SMOKING or VAPE caravan, with no smoking allowed in the caravan , on the decking or within the immediate area surrounding the caravan, anyone found to be abusing this will be evicted immediately. Haven Greenacres features a full daytime and night time activity programme to keep everyone entertained, it includes outdoor splash zone, indoor heated pool,toddlers pool, pub/restaurant, entertainment lounge,adventure golf, all weather sports pitches, amusement arcade, laundry, kart hire, archery, fencing, target shooting, pool parties, Zorbing and many more ! In the Mash and Barrel with all the sports channels. There is an on-site cash machine. The local bus comes on to site every half an hour taking you directly into Porthmadog where connections can be made to all parts of the country by either bus or train. There are ample shopping facilities in Porthmadog with a Tesco, Aldi ,Lidl, Wilco, Costa Coffee and Cadwalerders ice cream parlour to name but a few. Their are several take aways, banks, pharmacies, a medical centre and a post office. Local attractions include Snowdonia National Park, Portmeirion, Caernafon Castle, Ffestiniog railway plus many more. A non-refundable deposit of £50 is required immediately to secure your booking, we do not reserve bookings. We accept payments by bank transfer only. Full payment is required 6 weeks before commencement of holiday. 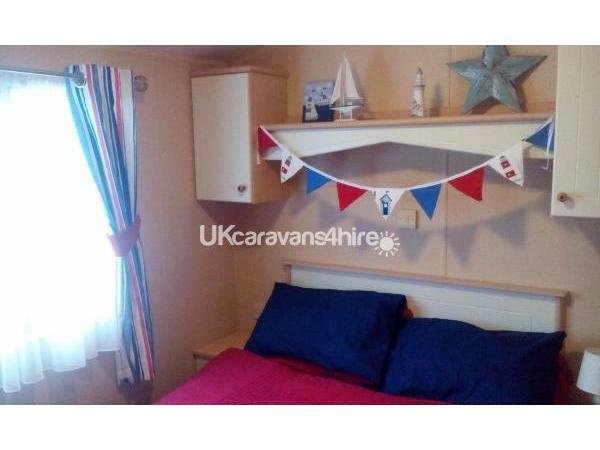 The caravan is available from 2pm on arrival day and must be vacated by midday on departure day. FUN PASSES ARE NOT INCLUDED IN THE PRICE. These can easily be purchased from reception should they be needed. 2019 fun pass prices have not yet been published.